So I’m out looking for something different to hear as an audiobook, and I look through the young adult section of listings and run across this book, “Beastly.” With young adult fiction it can be hit or miss, you can count big hits in the Harry Potter, Lemony Snicket series of books but when I tried the “Twilight” series I was let down. This book looked like a promising telling of a classic story. The premise of the book is based on the traditional fairytale “The Beauty and the Beast.” The author researched various versions of the fairytale, and even makes some reference to them throughout the book. This is by no means the Disneyfied version, so if you are looking for that type of fun, musical story with a happy ending, it’s not this one. This version of the story, while encapsulating the full meaning and feel of the classic, brings the story to modern times with some nice teen angst, cliques and materialistic views of life. In this book Kyle Kingsbury, the rich, handsome son of Rob Kingsbury, a famous news anchor, has lived all his life thinking that looks and money are all you need in life. He seems to be living proof of that, he dates the hottest girls and is the most popular guy in school. But when Kyle asks a not so good looking new student, Kendra, to the prom as a practical joke, Kendra, transforms Kyle into an ugly man who then turns into a beast. It turns out Kendra is really a beautiful witch. Kyle’s father is ashamed of his son’s appearance and locks him in a large apartment in downtown New York so no one will see him. Kyle’s only company is his housekeeper, and, later, a blind tutor named Will and his dog. Kyle changes his name to “Adrian”, which means “dark one”. His only happiness comes from the rose garden he plants and maintains in his small backyard, encouraged by Will. Adrian has two years to break the witch’s spell by falling in love and being loved sincerely despite physical appearances. The Beauty in this story comes in the form of Lindy. Lindy is a poor girl who attends Kyle’s school by scholarships. Her only hope to get away from her poverty stricken life, taking care of her drug abusing father is to maintain her grades. In being the bookworm sort she has gone through the school unnoticed. She does have a crush on Kyle, and at the same prom where Kyle is turned into the beaste, Kyle gives her a white rose, only because his girlfriend wanted an orchid and wouldn’t wear a “cheap rose.” This event is big to Lindy, but Kyle sees it as insignificant. 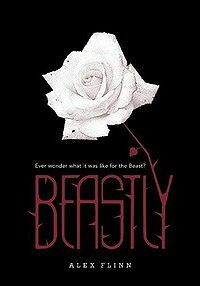 A man breaks into Kyle’s/Adrian’s rose garden and when the Beast confronts him the man pleads for his life and offers his daughter to the beast to avoid the police. Kyle learns this is Lindy’s father and finds this could be his last chance to find true love and break the curse. Kyle takes Lindy in and he must discover the secrets to true love and find his way to her heart. I will warn you once again this is not a Disney version and the Happy Ending is relative. The reader, Chris Patton delivers the story with perfect intonation of all emotions and character quirks that at times I almost thought I was listening to a multi-cast performance. The interesting thing I discovered is that this book has been turned into a movie, that will be released in 2011.